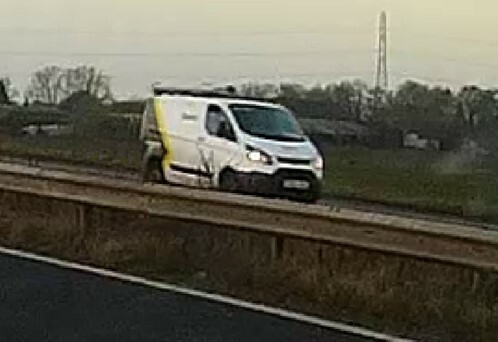 Lancashire Police are appealing for information about a van driver following a fatal collision on the M58. Police were called around 9am on January 8 after reports of a serious incident on the M58 motorway. An HGV, a minibus and a number of other vehicles had been involved in a collision between Junctions 3 and 4 westbound. Very sadly as a result of the collision two people, a woman and a 14-year-old boy, suffered injuries which proved fatal. A 31-year-old man from Chorley, was arrested on suspicion of causing death by dangerous driving. He has since been released under investigating pending further enquiries. Police are continuing to investigate the circumstances around the collision and are appealing for information to identify the driver of this van, pictured, who is believed to have witnessed the incident. Officers are urging anyone with information to come forward. Sgt Claire Pearson, of Lancashire Police, said: “As part of our investigation we are keen to identify this driver. “The collision happened around 8.43am and we believe the van, a Ford Transit dated from 2014, was travelling in the opposite direction. “We are confident the driver witnessed the collision and could have some key information to assist our investigation. Anyone with information can contact police on 101 or email 3847@lancashire.pnn.police.uk quoting log 275 of January 8.